Osei-Wusu Brempong, a native of Kofiase /Sekyedumase, was born on October 24, 1953 in Kumasi to Opanin Osei Kwabena and Madam Adwoa Antwiwaa, both of blessed memory. He started elementary school at SDA Primary School, Kofiasi from 1960 to 1966 and continued to L/A Middle School from 1966 to 1970. He then proceeded to Sekondi College from 1970 to 1975 and had his Post-secondary education at Wesley College, Kumasi, from 1975 to 1978. He did the GCE ‘A’ Level at Workers’ College in Kumasi from 1981 to 1982. He studied for the BA in Theology and Religious Studies at the University of Botswana, Gabrone, from 2001 to 2004 and obtained the M.A. in Theology and Religious Studies from the same university in 2005. He was employed as a Teacher at the Mmofraturo Girl’s Boarding School in Kumasi from 1978 to 1985. Osei-Wusu Brempong accepted Christ into his life on March 8, 1965 at the age of 12 and was baptized by Pastor Amponsah (the then District Pastor at Asante Mampong) during the annual August Convention on September 11, 1967. Apostle Osei- Wusu’s love for the Lord saw him serve in various leadership positions while in school. He was a staunch member of the Scripture Union and he later became the Vice President of the Union between 1974 and 1975 in Sekondi College. From 1976 to 1978 whiles at Wesley College, he was the curate assisting the College Chaplain. He served as the President of the Preaching Band and Vice President of the College Fellowship and also served as the Chief Councillor for CPC Christian Fellowship from 1978 to 1980 at Kumasi. Despite the various leadership positions, Osei-Wusu Brempong was a committed and dedicated member of The Church of Pentecost. He was mentored by Elder J. K Asante who was his Presiding Elder at Kumasi New Tafo Assembly. 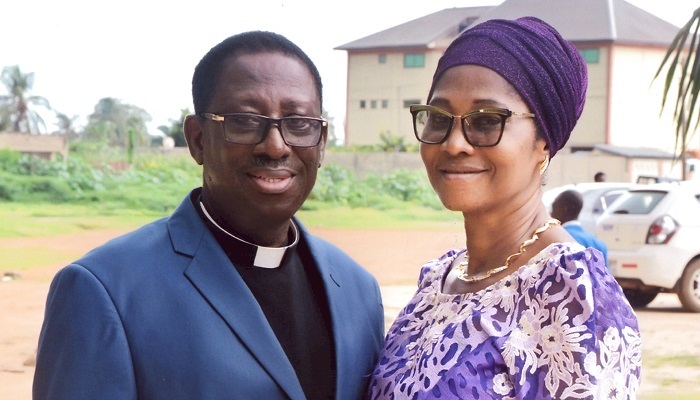 His Commitment and dedication to the work of God saw him becoming a Deacon in 1983 and appointed as the Witness Movement Leader at Kumasi New Tafo Assembly. During his time, he helped and led the Witness Movement to open many Assemblies including Yennyawoso and Antoa. He was ordained as an Elder in 1984. Throughout his ministry, Apostle Osei-Wusu Brempong travelled extensively to many parts of the world including the following: Ivory Coast, Nigeria, Burkina Faso, Togo, Benin, Namibia, Botswana, Zimbabwe, Kenya, South Africa, Malaysia, Singapore, France, Italy, Belgium, Holland, Switzerland, Germany, United Kingdom, Canada, United States of America, etc. Apostle Osei-Wusu Brempong is married to Miss Comfort Akua Afriye Boateng (now Mrs. Comfort Osei-Wusu Brempong). Their union has been blessed with five children, namely: Mrs. Linda Osei-Wusu Boye (deceased), Osei-Wusu Nyarko Abronuma (now Mrs. Kumi Larbi), Osei-Wusu Brempong Junior, Osei-Wusu Nyamekye, and Osei-Wusu Akua Afriye. Having a great heart of love for people, Apostle Osei-Wusu and his wife have cared for more than thirty (30) people in ministry. He catered for the education of most of them; from primary through to the university. It is, therefore, not surprising that more than twenty (20) children have been named after him. Apostle Osei-Wusu Brempong could not have had a successful ministry without the love and support of his better half, Mrs. Comfort Osei-Wusu Brempong. She is known to be a woman of prayer, zealous, industrious and generous. She is a mother with her doors wide open with affection and love to all manner of persons. By the grace of God, Apostle and Mrs. Osei-Wusu Brempong would be retiring from the full-time ministry of The Church of Pentecost on Sunday, August 19, 2018 at Shekinah Temple, Aflao after 33 years of active service in the Lord’s vine yard.